Get clean, di-ionized water – simply! 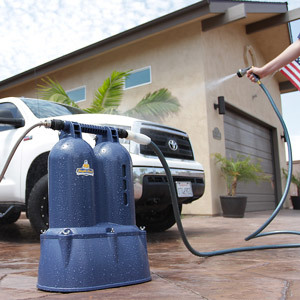 Simple Chuck's Double Chuck Spotless Water System is a water de-ionization unit that provides approximately 400 gallons of “spotless” water, allowing you to wash your car without fear of water spots! Manufactured to be as simple to use as possible, Simple Chuck's Double Chuck Spotless Water System features a stainless steel input hose, a pressure regulator, quick disconnects for input/output hoses, wheels, and foldable handle, and is shipped to you with a fresh set of cartridges – once it's delivered you are ready to go! There are a lot of outside factors to consider when washing or detailing your car – UV rays, wind, water restrictions, temperature, etc. But one thing you may not have considered? The type of water you're using! In many areas “hard” water is common – meaning that your water has high levels of minerals included. Why don't we like hard water? Water spots, of course! When hard water is allowed to dry on your vehicle's surface, the included minerals dry onto the surface as well, creating those dreaded water spots. If not treated, water spots, while unsightly, can also cause etching in your clear coat – sometimes even permanent damage! The trick to avoiding water spots to dry your vehicle's surface right after washing (and we mean RIGHT after!). But what if you had clean water to begin with? That's where the Simple Chuck's Double Chuck Spotless Water System comes in! This easy-to-use water de-ionization system takes your hard water and makes it soft! You can now wash your car with a total water-spot-free peace of mind! Simple Chuck's Double Chuck Spotless Water System uses a negatively and positively charged ion resin to chemically remove all the salts, minerals, and spot-causing particulates in the water. When do you need new filters? When they turn gold! Until they change color, you can use the Simple Chuck's Double Chuck Spotless Water System as many times as you need it (number of washes vary based on different water “hardness”). Replacement filters are available for purchase separately.